Interception of Communications and Surveillance Ordinance (hereinafter refers to “the Ordinance”), which took effect on 9 August 2006, has been ridden with loopholes over its nine year’s existence. The law enforcement agencies failed to carry out their functions, and the Ordinance’s scope of coverage has become obsolete. This year, the Security Bureau finally proposed to review the law, with the Legislative Council setting up a bills committee to follow up with the amendment. Given the lack of sufficient public consultation, Hong Kong In-Media (herein after refers to as “Our organisation”) fears the new amendment will only fix minor problems and allow law enforcement to monitor protesters and journalists without receiving any oversight. After the Umbrella Movement, Darryl Saw, the Interception of Communications and Surveillance Commissioner, told reporters that police was not surveiling personal communication transmitted on the Internet, such as through Whatsapp, indicating that the Ordinance does not cover Internet communications. The Ordinance should expand the definition of communication, and include Internet communications (e.g., Email, Google Hangout, Whatsapp, Telegram) into the list. When the Ordinance took effect in 2006, it states that the intercepting act over inspects content transmitted by postal services or by telecommunications systems. The Internet is increasingly popular in today’s society. The Ordinance is obviously obsolete. The Interception of Communications and Surveillance Commissioner (Note 1) once publicly admitted telecom operators provided assistance (to law enforcement’s interception and surveillance operations), but did not comment on whether Internet communications are covered by the Ordinance, indicating there’s obviously a murky grey zone in the Ordinance. In recent years, political parties, NGOs, journalists and lawyers all use Internet communication tools as a major platform for communication. If the government does not include Internet communication into the Ordinance’s scope of coverage, that would pose a severe threat to citizens’ personal information privacy, freedom of association and freedom of expression. The Ordinance should clarify the definitions of ‘relevant specific’ and ‘violence’. The intention of the enactment of the Ordinance is to set up a regulatory mechanism to oversee public officers’ interception of communications and certain types of covert surveillance operations. It is designed to ensure the four law enforcement agencies (Customs, Police, Immigration Department and ICAC) will protect citizens’ privacy and other rights while detecting crimes and keeping the public safe. The Ordinance and the Code of Practice prescribe that “advocacy, protest or dissent (whether in furtherance of a political or social objective or otherwise), unless likely to be carried on by violent means, is not of itself regarded as a threat to public security”, and “’Violence’ does not cover minor scuffles or minor vandalism”. Therefore, the authorities must set a clear definition on this to ease public speculation and concern over the government’s political surveillance conducted by the law enforcement agencies. Third, add provision to protect “journalistic material"
We strongly urge the Ordinance should set detailed provision on the interception and surveillance operations that may obtain “journalistic material". 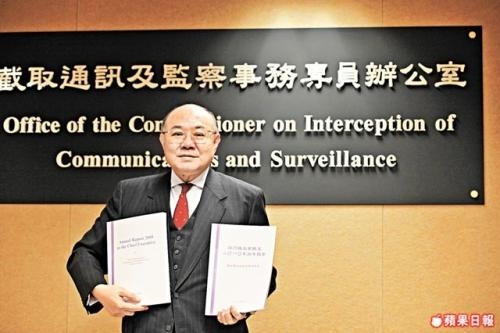 The former commissioner Woo Kwok Hin noted in the first annual report that “ journalistic material is not given as much prominence in the body of the Ordinance as LPP”; In 2010, law enforcement for the first time admitted that they wiretapped journalistic material by accident (Note 2). The Ordinance has been in force for nearly a decade. We urge the authorities to respond to media professionals’ concern as soon as possible, so that journalists can continue playing their roles in overseeing the government and safeguarding the public’s right to know. For many years, the Ordinance has been ineffective in overseeing non-compliances and has become a rubber stamp. The law enforcement agencies repeatedly violated the ordinance, but received almost no penalties. In the 2013 Annual Report, the commissioner observed that“most of the irregularities encountered and mistakes made by LEA officers were attributable to their inadvertence or negligence, which were uniquely related to the individuals concerned rather than defects in any of the control systems”(Note 4) . This comment indicated that the law enforcement possess too much power for the Ordinance and the public to oversee. The fundamental reason is because the Ordinance is not legally binding and therefore is unable to punish non-compliances of law enforcement agencies. Our organisation urges the authorities to give the ordinance legal force to punish non-compliances and protect the public’s rights to privacy. The 2013 Annual Report revealed that law enforcement agencies handled the storage of surveillance devices quite recklessly, which obviously posed a threat to personal privacy rights. The 2013 annual report noted that a law enforcement agency lost the original copy of a Record of Issue in respect of two surveillance devices (Note 4), which made it difficult for the commissioner to conduct examination. This reflected the necessity of enhancing the oversight of the storage of surveillance devices. In addition, our organisation urges the authorities to set up clear provision on the supervision of removable storage media (e.g. memory cards, discs and tapes). The Ordinance has yet to establish procedures for the issue and return of removable storage media. Under the existing Ordinance, there is no way for us to know if law enforcement officers have replaced or removed the memory cards, discs and tapes, not to mention supervise such activities. The 2013 Annual Report noted that some law enforcement agencies have adopted “the use of tamper-proof labels to seal the RSM inside the devices at the time of issue”, and the development of “prototypes of RSM which have affixed to them a Quick Response Code”. However, the Ordinance remains not legally binding.